M. Annius Florianus, the brother, by a different father, of the Emperor Tacitus, upon whose decease he was proclaimed emperor at Rome, A.D. 276. He was murdered by his own troops at Tarsus, after a reign of about two months while on his march against Probus, who had been proclaimed emperor by the legions in Syria. Obverse: IMP C M AN FLORIANVS P F AVG, Radiate, draped, and cuirassed bust right. Reverse: AETERNITAS AVG, Aeternitas standing facing, head left, holding globe and rudder; IIII. Reverse: PACATOR ORBIS, Sol running left, right hand raised, left holding whip, III. Obverse: IMP C M AN FLORIANVS AVG, Radiate, draped, and cuirassed bust right. Reverse: PROVIDENTIA AVG, Providentia standing left, holding baton and sceptre; at foot, globe, III. 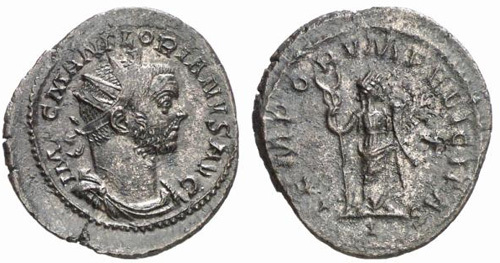 Reverse: TEMPORVM FELICITAS, Felicitas standing right, holding caduceus and cornucopiae. Reverse: TEMPORVM FELICITAS, Felicitas standing right, holding caduceus and cornucopiae, I. Reverse: VIRTVS AVG, Florian galloping right, spearing enemy. Reverse: VIRTVS AVGVSTI, Virtus advancing right, holding spear and trophy over shoulder; II. Reverse: VIRTVS AVGVSTI, Mars advancing right holding shield and spear treading down captive, IIII. Obverse: IMP C FLORIANVS AVG, Radiate, draped, cuirassed bust right. 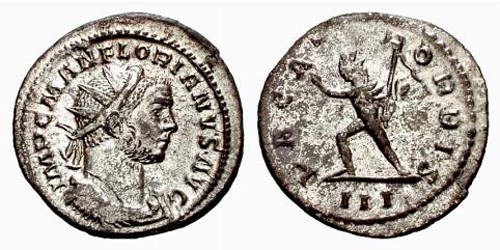 Reverse: AEQVITAS AVG, Aequitas standing left, holding scales and cornucopiae, XXIG. 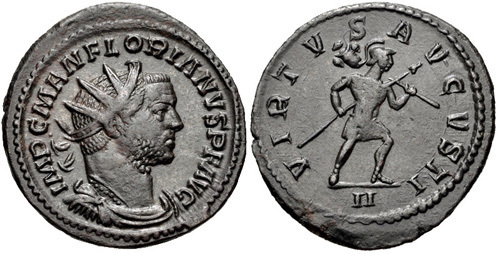 Reverse: AEQVITAS AVG, Aequitas standing left, holding scales and cornucopiae, G in right field, XXI in exergue.